The Mercer County Community College softball team following the 4-2 victory over Morris County College to capture the Region 19 Championship. 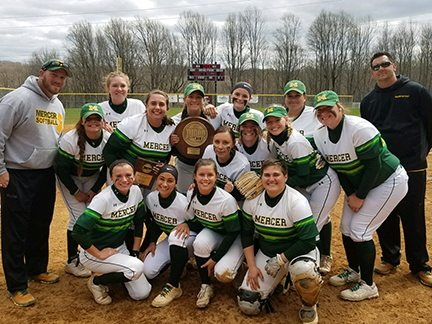 WEST WINDSOR – The Mercer County Community College (MCCC) softball team is one step closer to the National Junior College Athletic Association (NJCAA) tournament after capturing the Region 19 crown on Sunday, April 29. The number one seeded Vikings were a perfect 3-0 in the double-elimination Region 19 Tournament in Randolph, N.J., defeating Rowan College at Burlington County 5-0 and notching two wins over number two seed Morris County College, 4-1 and 4-2. Sophomore pitcher Kaley Wise, a Steinert High School graduate, got the win in all three contests. On the offense side, key contributors in the weekend tournament include sophomore pitcher/catcher Tatum Marshall of Bordentown, who tallied five RBI off of four hits, including a home run. Freshman outfielder/infielder Tori Bowen, of Columbus, N.J., and sophomore shortstop/outfielder Alisha Patel of Burlington contributed four hits each. Wise also added a three-run homer in game three to ice the championship – with two outs in the bottom of the sixth and trailing 2-1. With a record of 35-6-1, the Vikings now head to the shores of Lake Erie to take on Mercyhurst in North East, Pa., for a best-of-three series in the District Tournament. The winner will earn a berth in the NJCAA National Tournament in Clinton, Miss.